In my last blog I shared that this week would be about spiritual mindset, and how we can we have a healthier dance with the “dramas” of our life. And while that is true and I want to share my perspective on that, something else came up I wanted to share first that I know you can relate to. In August, as many of you know, I had a terrible accident trying to water ski. I am still healing and expect a full recovery. I now have an opportunity to scuba dive in Tobago during New Years and I wonder if I am friggin’ nuts. I would love to dive. I would love love love to go under and swim with the beauty that is below the surface. But, I AM STILL SCARED OF THE WATER. Now what? I am sharing this because I know I am not alone in feeling the fear toward something I want to experience in my life – new opportunities present themselves all the time and we have to make decisions whether to say yes or no. Have you ever wanted something important only to find yourself paralyzed with fear and not take action? Did you persevere? Did you stop yourself and wish you could have had a different outcome? Some voices I hear are: ”Are you an idiot to try another water sport when the last time was a total screw up?”, “Why take the risk, it isn’t that important!”, “Things are fine the way they are, take it easy and just accept where you are as good enough. Be thankful you survived the hamstring tear!”. Yep, lots of messages telling me to skip the scuba and go bird watching instead. But I have another plan for this dilemma. In the following video I will tell you what my actions are going to be as I decide whether or not to go under the sea. 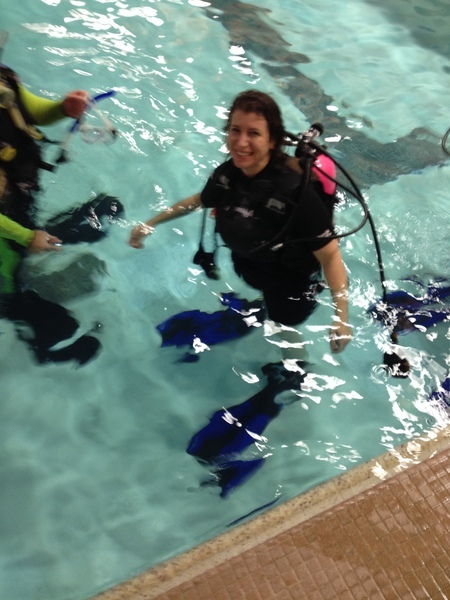 I will also let you in on my total breakdown during my first scuba lesson. Omg…. The poor instructor didn’t know what to do with me. As you watch this, use my diving opportunity as a metaphor for something you want for yourself and are having to make choices as to whether you move on it or not. And then comment below the video. I would love to hear about your adventures and how you are going about achieving them! Sandra, thanks. yes it is easy to forgot the unconscious pulls that can run the show. I hear that diving is other worldly and hope I choose to do it when i get there. Thanks for sharing!!! Wow – although water is not my fear (learned water skiing as a kid & scuba when in college – don’t do either NOW very much due to time, equipment) I can totally relate to fear getting in the way of life choices and am really impressed with your process! Hope it all works out for you… I have to keep in mind the step-by-step process and make a plan for & identify mine. Being underwater w coral reefs etc.. AWESOME!!!! I’ve only snorkeled there (have to keep going up and down for air) or stay at the top of the water and look down), so your goal will be worth the effort (from my experience)…..
Susan, thanks for sharing. Life is a step by step process. I know for me I need to remind myself that I have choices and I can change course at anytime if I stay awake. and yes, having a plan helps so much. I knew if I jumped on the plane and went to my vacation the outcome would not be pretty so I planned to take it step by step. we shall see!!! Yep, trying new things can be a bit scary but it certainly keeps things alive and fresh. Thanks for sharing Karin! June, what a beautiful expression of your raw feelings. You always express things so eloquently. Your words were very helpful in guiding me through the process of assessing and doing something new! yay Dawn!!! Rock it girlfriend!